The Gutter Fix RF-H is a professional device for road construction. 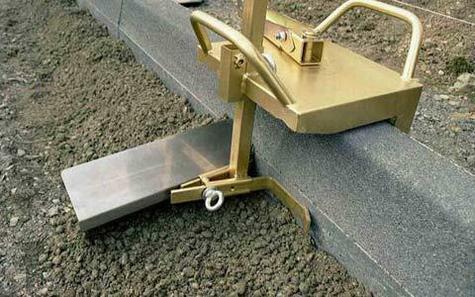 In one working step large paving blocks can be installed in lean concrete to form the gutter. No more time consuming screeding work! Time saving due to easy handling. The RF-H can be pushed by one operator, if required a second operator can assist in pulling with an integrated standard hooking point for shovel. The adjustment of the ground level and the width of the kerb is done simply and quickly by using clamp bolts (no tools are necessary). Large rollers which are touching the top surface and the rear surface can be easily pushed. The plowshare is made of extremely high wear-resistant V2A stainless steel.